Summary and Definition: The home front of America in World War I witnessed a systematic mobilization of the entire population and the economy to produce the troops, food supplies, munitions and money needed to win the war. Federal Mobilization Agencies were established including the War Industries Board, the Committee on Public Information, National War Labor Board and Railroad, Food and Fuel Administrations. Woodrow Wilson was the 28th American President who served in office from March 4, 1913 to March 4, 1921. One of the most important events was America in WW1 and the events at home. 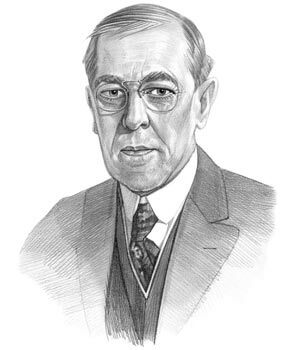 At the outbreak of WW1 President Wilson adopted a neutral position in an effort to keep America from being drawn into the war that was raging in Europe. His neutral stance kept the US out of the US conflict for 2½ years but the actions of Germany violated US neutrality by attacking international shipping with its unrestricted U-Boat submarine warfare campaign. America declared war on Germany on April 6, 1917 and the ill-prepared nation was faced with meeting the demands of entry into World War One - the Great War. In April 1917, the American Army numbered only 300,000 including all the National Guard units that could be federalized for national service. America in WW1 Fact 1: The date of the US entry into WW1 was April 6, 1917, two and a half years after the war had begun. The date that World War 1 ended was 11 November 1918.
the order men were called before a local draft board (run by civilians from local communities) in charge of exempting or selecting people for military service. America in WW1 Fact 3: Just under 3 million Americans were drafted in WW1 and approximately 2 million others volunteered for military service. America in WW1 Fact 5: African Americans in WW1 - the "Great Migration": The number of white workers drafted and the halt of immigration from Europe led to a need for additional labor in factories and industries in the north. Between 300,000 and 500,000 African Americans left the South to settle in Northern cities which became known as the "Great Migration"
America in WW1 Fact 8: Women in the US Navy: The navy authorized the enlistment of women mainly to meet its clerical requirements but also as torpedo assemblers, radio operators and pharmacists. Over 11,000 women served in the US navy during WWI. America in WW1 Fact 9: Women also took jobs in factories and industries producing supplies needed for the war effort. 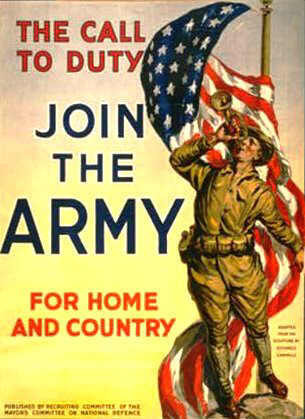 America in WW1 Fact 10: Hollywood joined in the war effort making propaganda movies and shorts and the movie stars encouraged the sale of war bonds. Facts about America in WW1 for kids and events at Home are detailed further in the fact sheet for kids. America in WW1 Fact 11: The American Federation of Labor (AFL), and nearly all labor unions were strong supporters of the war effort. America in WW1 Fact 13: In May 1917 the US government passed the Lever Food and Fuel Act. Food Administration was headed by Herbert Hoover in an effort to conserve food and boost agricultural output in the US. America in WW1 Fact 14: In May 1917 the Committee on Public Information, also known as the CPI or the Creel Committee was established. The Creel Committee began to issue official propaganda. In Washington, D.C. daily 'Official Bulletins' were issued to convince Americans to influence U.S. public opinion regarding American participation in World War I.
America in WW1 Fact 15: The Black Tom explosion on July 30, 1916, in Jersey City, New Jersey, was an act of sabotage by German agents to destroy munitions that were to be supplied to the Allies in World War I.
America in WW1 Fact 17: The National Defense Act was passed on June 3, 1916. The Espionage Act of 1917 became effective on June 15, 1917 and designed to punish acts of interference with the foreign relations, US foreign commerce, to punish espionage. America in WW1 Fact 18: There was a strong wave of anti-German sentiments and German citizens were required to register with the federal government and always carry their registration cards. America in WW1 Fact 20: On August 23, 1917 the Federal Fuel Administration, run by Harry Garfield, was created to manage the nation’s use of oil and coal. To conserve energy, Harry Garfield introduced daylight savings time and shortened workweeks for factories that did not manufacture war materials. America in WW1 Fact 21: On December 26, 1917 the U.S. government took temporary control of nation's railroads under the Federal Possession and Control Act in order to increase operating efficiency and modernize equipment. America in WW1 Fact 22: In March 1918 Congress created the National War Labor Board to prevent strikes that would disrupt production in war industries. America in WW1 Fact 24: The Sedition Act of 1918 became effective on May 16, 1918 extending the Espionage Act of 1917 to cover a broader range of offenses, notably speeches containing expressions of doubt about America's role in the war or interfered with the sale of government bonds. America in WW1 Fact 26: Fighting during World War 1 ceased when an Armistice, or temporary cessation of hostilities went into effect on the eleventh hour of the eleventh day of the eleventh month on November 11, 1918. The article on the America in WW1 provides detailed facts and a summary of one of the important events during his presidential term in office. The following Woodrow Wilson video will give you additional important facts and dates about the political events experienced by the 28th American President whose presidency spanned from March 4, 1913 to March 4, 1921.